This is such an easy soup recipe. While I was in Greece last year one of my favorite things that I ate was chicken soup. After a long night of Greek dancing with some locals till 6 am in the morning we worked up quite the appetite. They took us to a place on Mykonos Harbor that never closes and ordered us up this amazing chicken soup with fresh lemon juice squeezed on it. It was just unreal. This is my version of that delicious soup. In a heavy bottomed pan heat up olive oil on medium high heat. Add your garlic and scallions and cook for about 1 minute. Add your chicken stock to the pot and turn on high to let it come up to a boil. Once it comes up to a boil add your uncooked orzo, garbanzo beans, and zest of 1 lemon. Give it a quick stir, and let it cook on high for about 10 minutes. Add the cooked chicken, spinach, lemon juice, salt, and pepper. Give it another quick stir and you're ready to serve! I like to ladle it in a bowl and to the top add some shaved Parmesan, pepper, and a little extra squeeze of lemon. I also like to serve with some nice toasted crusty bread for dipping. 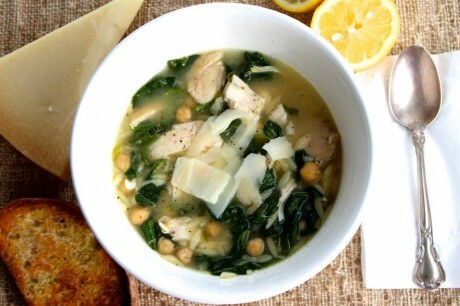 This soup is great for lunch or dinner and it is healthy as well. Happy eating! Yum….I’ll have﻿ to make this soup! It looks so delicious! Quick and easy. I like﻿ it! Another great recipe! How bout showing us a recipe in high heels and a bikini? Lights, camera,﻿ ACTION! Love your smile! I﻿ was hoping you were going to serve it topped with some cheese! Looks delish! Delicious soup!! I will definitely be making again.